The recent release of iOS 10 unlocked a creative coding opportunity for iPad classrooms called Swift Playgrounds. It’s an iPad app that lets you solve interactive puzzles that are designed to help you learn the basics of how to code in a programming language called Swift. It is aimed at students aged 12 and over and is part of Apple’s Everyone Can Code initiative. So, if you are looking for new ways to start coding with students, this could be a great new platform for you to explore. Here’s what you need to know. Swift is an open source programming language that was developed by Apple engineers and released in 2014. It was created to help developers build apps for iOS, macOS, watchOS and tvOS. Swift has its origins firmly rooted in another programming language called Objective-C, but Swift is generally considered to be more concise. The app, Swift Playgrounds, was developed to help introduce a younger audience to the finer points of programming with Swift, and to help foster a new generation of programmers for Apple devices. Swift Playgrounds is only available for iPads running iOS 10 or later. You also need at least an iPad Air, or an iPad Mini 2, because these are the oldest devices that are capable of running the app. The iPad 2, the iPad 3, the iPad 4 and the original iPad Mini are not compatible Swift Playgrounds because they either can’t be upgraded past iOS 9 or lack the hardware necessary to run the Playgrounds app. If recent predictions are to be believed, the podcasting scene will explode in 2016. For me, that’s great to hear because I am a big fan of podcasts, but it is also great news for teachers who are looking for new ways for their students to communicate their ideas and reach a global audience. So, with that in mind, here are some of the best apps for podcasting on the iPad. Depending on who you ask, the definition of podcasting can vary. Some people think they are podcasting when they record audio, but to most who are familiar with podcasting, this leaves out one important aspect, namely the ability to reach that global audience. So, here’s a definition I like from the Oxford Dictionary. The practice of using the Internet to make digital recordings of broadcasts available for downloading to a computer or mobile device. Podcasts can be recorded in a video and/or audio format and are often distributed through RSS feeds or other subscribable services. How Do You Podcast on the iPad? As a truly multimedia device, it shouldn’t come as much of a surprise that you can record a very decent podcast on the iPad. For video podcasts you can use the iPad’s camera, but if you want to keep it simple, audio podcasts are a great place to start. The built-in microphone does a decent job with many apps, but a more professional sound can be achieved if you use the 30-pin or Lightning to USB Camera Adapter to plug in a USB microphone. You can also choose from a variety of external microphones to use with the iPad. What are the Best iPad Apps for Podcasting? There are many different apps that will let you record audio on the iPad, but some are more suited to podcasting than others. Here are a rundown of some of my favorite iPad podcasting apps for the classroom. If you are looking for a great all-in-one solution, Opinion Podcasts is a great place to start. It lets you record, edit and publish podcasts for free. They give you a webpage to use as the home base for all your podcasts and even supply an RSS feed that you can use to submit your podcast to iTunes and other podcast directories. Opinion also shares to SoundCloud, Dropbox, Google Drive, e-mail, and iMessage. You can also import audio for sound effects or intro music from your iTunes music library, Dropbox, iCloud, Google Drive and others. Recordings are limited to ten minutes in the free version, but you can unlock unlimited recording with a $3.99 in-app purchase. Check out Room 108 Oklahoma City by Shelly Fryer (@sfryer) for a perfect example of how Opinion Podcasts could work in the classroom. Another useful all-in-one option is AudioBoom (formerly AudioBoo). Like Opinion, you can record, edit and share 10 minute clips for free from the AudioBoom app. It is a little less flexible in that you can only send your audio clips to AudioBoom, and you cannot import any audio from other sources, but sometimes simplicity is better. Of note, this app is rated 12+ because AudioBoom also gives you the ability to search and listen to a variety of other podcasts. Not all may be suitable for young audiences, so that is something to be aware of. That said, AudioBoom can be a great host for a class podcast. Check out Fifth Grade Fever, a daily podcast created by the students of Scott Hagedorn (@mrhagedorn). Talking a side step away from the packaged solution is a free app called Voice Record Pro 7. This is an extremely versatile audio recording app that I first learned about from Wesley Fryer (@wfryer). You can import and export audio from Google Drive, Dropbox, OneDrive and Box. You can also export to SoundCloud or an FTP server. One compelling feature is the ability to export the audio as a video file, with an image, and send it to YouTube. This would be a great way to add to a class YouTube or student YouTube account with minimal effort. It also gives you a huge audience to interact with your media, as well as the ability to embed it on school or classroom websites. The IPEVO Whiteboard app for iPad is a great, free solution for teachers who want the benefits of a document camera, without the added cost of new hardware. It is an extremely versatile app that gives you yet another way to use your iPad for teaching and learning. Here’s how it works. Although you absolutely can use the app with a compatible IPEVO document camera, you really don’t need to because the IPEVO app can be used in three additional ways. You can use it with your iPad’s video camera, you can import an image from your camera roll, or you can use a whiteboard. An array of annotation tools (pens, text, and a pointer tools) are available for you in all of these modes. The app itself is very easy to use with intuitive icons and a self-explanatory navigation. However, if you get stuck, you can tap the question mark in the bottom left-hand corner to get an overlay of the functions that each button will perform. To take advantage of an app like this, you really need the ability to connect your iPad to an LCD projector or an HDTV. In the camera mode, the projector allows the whole class to see something they may not all normally be able to see at once, and give the chance to annotate over a lab experiment in science, a piece of student work, an historical artifact or whatever else you want to show. You even have the option of recording live video while you annotate on your screen. In the whiteboard mode you have a portable interactive whiteboard that you can use to teach lessons or pass around to students so that they can demonstrate their learning. However, you again have the option of recording while drawing on the whiteboard. This means you can create great looking screencasts quickly and easily. All of your recorded videos are saved automatically to the camera roll for future use. Of course, if you do use your iPad as a document camera, a stand to sit your iPad on is very useful. However, it needn’t be an expensive outlay. Makeshift items like a spare locker shelf works just as well. Clint Stephens also has a great YouTube video on how to make your own for about $7 in spare parts. Document camera stands can also be great for more than just traditional uses of a document camera. They can also be great for making stop motion movies. Check out the example below from Tami Rondeau’s class and you will see what I mean, or get more ideas by reading this article: Using an iPad as a Document Camera. IPEVO Whiteboard is an app I have been showing teachers for a little while now, and every time I demonstrate it, I get the same positive response, not least because it does so much for free. It deos the job of several individual apps, and it does it very well. So, if you haven’t tried it out yet, the IPEVO whiteboard app is well worth a look. When creating materials for professional development with teachers, I always try to ensure that my visuals are clear, well-designed, and easy on the eye. So, when I do iPad training, I often turn to a variety of screenshot apps in order to achieve these goals. The apps below are some of my go-to apps and are ideal for creating tutorials or eye-catching graphics for iOS devices. One of my favorite apps is Screenshot – Frame Maker. It is a simple app, but a clever one. It automatically detects your device type and orientation and provides an appropriate frame. You can adjust the margins and choose whether you want a reflection on the screen or not. Framed screenshots can be saved to Dropbox or the camera roll, and shared by email, Twitter, or Facebook. You can also copy the image to paste into other apps. Screenshot – Frame Maker is free, but if you want to create more than five images, you need to spend 99c on an in-app purchase to unlock unlimited exports. However, only real screenshot images can be used in this app. You can’t just add any picture from your camera roll. The only small issue I have with this app is that there is no option for an iPad Air frame, even if you use an iPad Air screenshot. You can choose between the older iPad 2 style frame or the iPad Mini. Given that the iPad Air design is a lot like an iPad Mini, this is the frame I choose most often. An example is included below. A similar app that is also well worthy of consideration is Screenshot Maker Pro. It includes several options that Screenshot – Frame Maker doesn’t offer. For instance, you can add any image to your device frame, not just screenshots. You also have a choice of devices that you want to use. As well as iPads, you can also choose from every version of the iPhone, the Apple Watch, the Macbook Pro or an iMac. Screenshot Maker Pro includes several angles for these devices, lets you add a drop shadow, and even a ground reflection. This app is free for up to two framed screenshots. After that, you need to pay the $2.99 in-app purchase to unlock unlimited exports and remove the ads. Images can be saved to your camera roll and then shared to other apps on your device. I enjoy using this app, but again, there is no frame for an iPad Air, so I am thinking that there must be a reason for this. An example with the iPad Mini frame is below. Of course, once your screenshot is saved to the iPad, you can continue to add to it by adding annotations in a free app like Skitch. It lets you add shapes, arrows, text and more to your framed iPad screenshots. It even has a handy blur tool that lets you obscure sensitive information like email addresses or passwords. 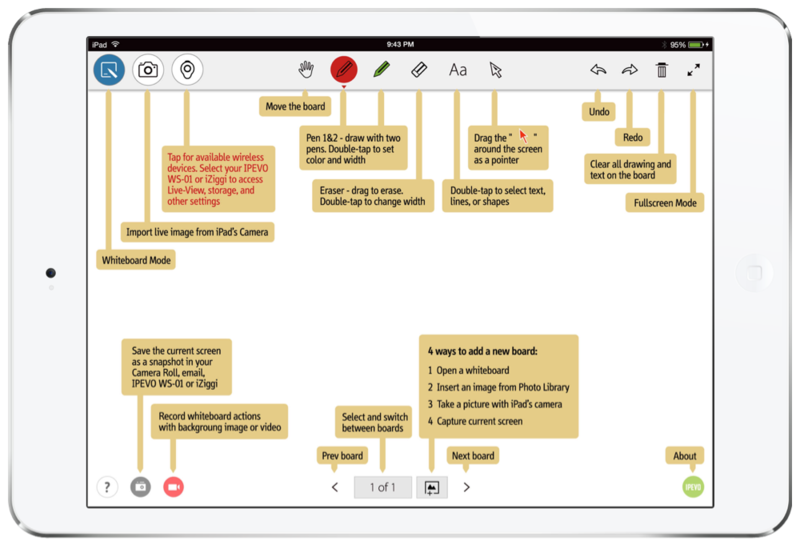 Skitch is an extremely versatile app, so it is no wonder that it is so popular with educators using iPads in the classroom. Take a look at the example below to see some of the things you can do with Skitch. Unfortunately, a byproduct of creating all these awesome framed iPad images is that your camera roll is now chock full of redundant screenshots that are doing nothing more than taking up precious space on your device. Thankfully, there is an app for that: Screenshots – Find, Share, Hide, and Delete Screenshot. This useful app will find all the screenshots in your camera roll and let you delete the ones you don’t want in just a couple of taps. Screenshots is a universal app that works on iPhones and iPads. So, whether you are putting together some training materials, or looking for some graphics for a flyer or a website, these iPad screenshot apps should definitely be on your shortlist. Related article: How to Take a Screenshot on an iPad and Annotate it! When using an iPad, there are not many free video editors that are robust enough, or have enough features, to warrant you spending a lot of time and effort on. Recently, I write about the Clips Video Editor. It is a great free option for schools or anyone else who is looking for a quick easy editor. Today I am writing about a new app that recently got a big overhaul to make it much more useable. It is called Cameo by Vimeo. Technically, Cameo is an iPhone app. It is optimized for an iPhone 5, 6 and 6 Plus. However, it runs just fine on an iPad if you want it too. It doesn’t have a whole lot of bells and whistles, but it does the basics well and has some nice touches that you may not find in other apps. You can see a sample video below that I very quickly put together with the Cameo app. Getting started is easy. Simply pick the clips from your camera roll that you want to add. Right now, it is video only, no pictures. Once you have the clips you need, your movie will begin playing but you can jump into the editor screens by tapping one of the three buttons in the bottom right hand-corner of your screen. The scissors icon is a great place to start. Here you can trim the beginning or end of a clip, rearrange the order of your clips, add a caption or title to one or more clips, and optionally mute the audio of any of your videos. A number of audio tracks are built-in to the app and are available by tapping the music icon. Here you can browse by genre or see the featured artists that Vimeo is highlighting. The last button (the color pallete icon) lets you choose a theme to apply to your video. This is optional, but some nice effects can be achieved by choosing a video filter, and Cameo allows you to vary the strength of any effect you add. Each theme has its own selection of fonts that will be applied if you add any titles. Once you are done editing, tap the check mark in the top right-hand corner of the screen. At this point, you can give your video a title, choose a thumbnail, and add a description. You can choose to upload it to Vimeo, or save it to the Camera Roll. Note that finished videos will automatically fade to black at the end, and so will the music. Also, if your video is longer than your chosen music track, the track will automatically loop. At the moment, this is not something that the Clips Video Editor does. All in all, it is a very polished experience, and a nice video editor that could be ideal to introduce students to the power of video editing. It is missing a few things that you might want like transitions or the ability to set the volume of a music track. It would also be great if you had some ability to create exit titles to cite source materials, but otherwise there is a lot of positives here and I enjoyed using the app. I have no reason to suggest otherwise, but if the app remains free, it is easy to recommend it for the classroom. I’ve always liked Vimeo. You might not always have the choice or variety you get with sites like YouTube, but there is a lot less noise. There are also some great storytellers on Vimeo, many of which are highlighted in Staff Picks each week. Some of these videos can be great model examples for film, journalism, and language arts students who are looking to tell digital stories of their own. Another reason I like Vimeo is for the stock footage channels. There are several film makers on Vimeo that freely distribute video clips for you to use and download for your own use. The ones on the video clip above, were sourced from a Vimeo Group called Free HD Stock Footage. I often look here when I am looking for background videos for things like green screen video projects on the iPad. So, if you are looking to edit video on the iPad, and don’t have the time (or money) to spend on iMovie, Cameo is well worth a look. One of the more popular posts on my blog of late was a post I wrote about how to make Gmail the default mail app on the iPad. It worked great, but it was a workaround and you couldn’t help but feel that there must be a better way. Well, today there is, because Google updated the Gmail app to make it do (almost) everything that you need it to do in order to use Gmail as your default mail app on the iPad, iPhone and iPod Touch. Here’s what you need to know. 1. Open the app that you would like to have Gmail available as your default mail client to share links, files or other information. Examples of apps might include Safari, Chrome, Photos, Flipboard, etc. 3. Tap More, and scroll down through the list of apps until you find Gmail. 4. Tap the toggle switch next to the Gmail app to turn it green and activate Gmail as a sharing option on your iOS device. 5. The three horizontal lines to the right of the toggle switch will let you drag the Gmail app further up the list so that it is more readily accessible when you need it to share. Once you have it where you want it, tap Done. That’s all there is to it. The next time you find a website you want to share, a photo you need to email, or a file you want to attach to a Gmail message, simply go to the share menu in the app you are working in, and tap Gmail to open a new email. So, no more workarounds, no more headaches, and no more wishing for things to be different, because Google has made the changes that lots of people wanted to see and updated their app so that you truly can use it as the default email app on your iOS device. Today Google released two standalone apps for Google Docs and Google Sheets. They are available for iOS and Android, and perhaps most exciting of all, another new app for Slides is on its way. So, how are they different to the iOS Drive app? Let’s find out. In terms of features, the big difference is the ability to create and edit documents offline. This is obviously nice to have, but it does not work with the “old” Google Spreadsheets, only with the “new” Google Spreadsheets or spreadsheets you create inside the app. Additionally, seeing as they are separate apps, you only see your Docs in the Docs app and Sheets in the Sheets app. Teachers of younger students in a GAFE school may appreciate the separate app for just that reason. It’s also a little easier to share a doc, because just like the desktop version you can now do that from inside the document or spreadsheet by pressing the “i” in the top right hand corner. You can also use Speak Selection on selected text to read that text aloud, which is great as as an assistive technology tool. You can now set a passcode lock for each user of the app. This could potentially be handy if your iPads are shared devices, but you will not always be prompted to enter a code or choose an account each time you open the app unless you choose the “always lock” feature, so turn that on to switch between users every time you open the app. Lastly, and perhaps most significantly, the Docs and Spreadsheet apps are now the only way to create and edit Docs and Spreadsheets. Google has removed that functionality from the iOS Drive app, and turned it into a file manager like Dropbox, Box or OneDrive. If you hit the “+” sign and try to create a new document, you will be prompted to download the new Documents app if you don’t already have it.